The story of Homo neanderthalis began with a chance discovery. In 1848, a strange skull was discovered on the British military outpost of Gibraltar. When it was first revealed, it confounded everyone who saw it. There was no doubt it was human, but it also had the heavy features of an ape. Soon, remains of the savages were being found all over Europe. From the Atlantic coast almost to the foothills of the Himalayas and south into the Middle East. They were everywhere. Homo neanderthalis - commonly known as Neanderthals - lived during one of the toughest periods in human history: the most recent ice age. During this time the climate of Europe varied enormously, but it was characterised by periods of intense cold. At its worst, most of Britain was blanketed by polar ice which was over a mile thick. For hundreds of miles to the south there was nothing but desolate wasteland. Life in the north would have been impossible. But it seems that further south, where the frozen tundra began to melt, Neanderthals could survive, living on the fringes of broken woodland. To exist for so long in such harsh conditions most scientists believe that Neanderthals must have been biologically adapted to the cold. There were, however, slightly warmer periods further north, and early Neanderthal remains dating from 400,000 BC have been found at Boxgrove in Sussex, southern England. Evolved from Homo heidelbergensis, the Neanderthal brain size was twelve percent larger than that of modern humans and they relied on a heavy meat diet. They were as formidable as the ice age environment in which they lived. Their short, squat physique was an ideal body shape for conserving heat - they usually reached no more than 1.7 metres tall (five and-a-half feet). But despite their small stature, they had big, powerful muscles - a sign of the demanding lifestyle they led. They looked out at their harsh world from under a bony ridge that arched across their foreheads. Set in the middle of their long faces was a long projecting nose which distanced the delicate tissues of the brain from the frozen ice age air. They were skilled hunters, cooperating together in hunting parties. Neanderthals exploited the natural landscape to surround their quarry and make their kills at close range. This hunting practice left many Neanderthals with painful injuries, but they could often simply shrug off the more minor of them. Social relations were important to the Neanderthals, and these were maintained through language. The cerebral symmetry of a Neanderthal brain was the same as any modern human being would show, with no difference in the shape of the frontal lobe. So the prefrontal portions that are supposed to deal with very complex cognitive functioning are about identical between Neanderthals and modern Homo sapiens. The Neanderthal hyoid bone, which holds the voicebox in place, shows they were capable of complex speech. But their sentences were probably basic, and loud. Their larger chest cavities would have supplied much more force to their speech than Homo sapiens could later manage. Professor Stanley Ambrose of the University of Illinois at Urbana-Champaign is of the opinion that they spoke a good deal in the imperative: 'Give me the object' rather than 'Could you perhaps give me the object?' as modern humans might say. These cave-dwellers even cared for the elderly and infirm (Homo georgicus has been found to have done the same). An elderly male Neanderthal known as 'La-Chapelle-aux-Saints 1' had lost all his molar teeth, making it impossible for him to chew his food. But the bone above his tooth cavities had partially healed, suggesting that other Neanderthals chewed his food for him before feeding it to him. 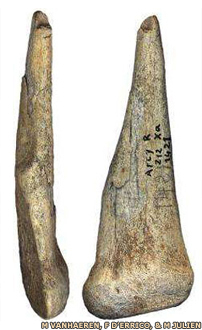 Neanderthal home ranges were extremely small. Their tools are rarely found more than 50km (30 miles) from their source. Early modern humans maintained social networks over distances of up to 200km (124 miles). The archaeological record suggests that Neanderthals hunted on the edges of forests, preying on large animals, like red deer. A group of Neanderthals needed to kill one of these every two days to survive. To hunt effectively they needed weapons, and they left behind a wealth of well crafted stone spearheads. A skull was discovered by a labourer in 1921 at Broken Hill in Northern Rhodesia (now Kabwe in Zambia). 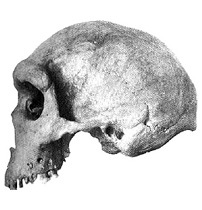 It was initially named Homo rhodesiensis ('Rhodesian man'). 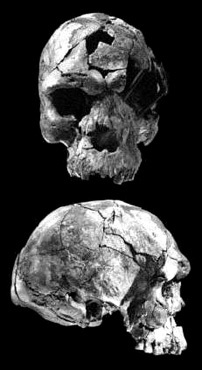 It is now commonly referred to as the Broken Hill Skull or the Kabwe Cranium. This was in fact a sample of what was commonly referred to as the group Homo sapiens (archaic). It was a complete cranium that was very robust, with large brow ridges and a receding forehead, similar to Homo neanderthalis, but with a cranium intermediate between advanced Homo sapiens and neanderthalis. Most current experts believe rhodesiensis to be within the group of Homo heidelbergensis though other designations such as archaic Homo sapiens and Homo sapiens rhodesiensis have also been proposed. 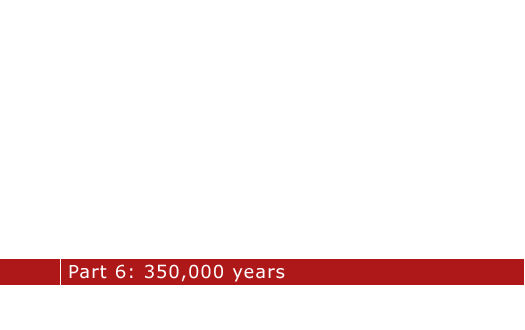 Its estimated age is between 200,000 and 125,000 years. The brain size was about 1280cc. It seems likely now that this was either an example of late heidelbergensis or an intermediate stage between heidelbergensis and Homo sapiens. Incredibly, it seems that there may have been several sub-groups or variations of Homo sapiens around at this time, as a new study proved at the site at which two partial skulls were found in 1967. This new study pushed back to 195,000 years ago the date for the first appearance of anatomically modern humans. The remains, classified as Omo I, were found alongside remains of a slightly more primitive version, called Omo II, confirming the existence of contemporary populations which were anatomically different but which could still be broadly categorised as archaic human. Homo rhodesiensis was robust, with very large brow ridges and a broad face. Homo sapiens idaltu appeared by this time, if not earlier (idaltu means 'elder' in the Afar language of the Herto region). Critically, three skulls discovered in Herto, in the Afar region of eastern Ethiopia initially showed that this subspecies bridged the gap between Homo heidelbergensis in Africa and the fully modern humans which spread out into the Middle East up to 100,000 years ago. The skulls are not an exact match to those of people living today; they are slightly larger, longer and have more pronounced brow ridges. All the skulls had cut marks indicating they had been de-fleshed in some kind of mortuary practice. The polishing on the skulls, however, suggests that this was not simple cannibalism but more probably some kind of ritualistic behaviour. This type of practice has been recorded in more modern societies, including some in New Guinea, in which the skulls of ancestors are preserved and worshipped. The Herto skulls may have marked the earliest known example of conceptual thinking - the sophisticated behaviour that sets humans apart from all other animals. The conclusion of the discoverers was that the Herto skulls 'sample a population that is on the verge of anatomical modernity but [is] not yet fully modern'. They therefore assigned it to a new subspecies called idaltu, 'because the Herto hominids are morphologically just beyond the range of variation seen in AMHS [anatomically modern Homo sapiens], and because they differ from all other known fossil hominids, we recognise them here as Homo sapiens idaltu, a new palaeosubspecies of Homo sapiens'. Both anatomically and chronologically, the Herto skulls seem intermediate between earlier and more primitive skulls such as Bodo (Homo heidelbergensis, dated around 600,000 years ago) and Homo rhodesiensis, and the first completely modern human skulls. 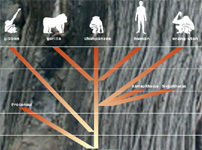 It was originally though that this transitional species was to disappear within 10,000 years as full-blown Homo sapiens emerged in Africa, but it is known known that Homo sapiens appeared much earlier, by 195,000, so Homo sapiens idaltu must have been one of several contemporary variations which existed for a time. Images copyright © BBC or affiliates unless otherwise stated. No breach of copyright is intended or inferred. Text copyright © P L Kessler, adapted from numerous sources and notes. An original feature for the History Files.